There are two parts to this festival, Loy Krathong, where elaborately decorated banana wood or bread boats called ‘krathong’ are floated on rivers and ponds while the creator of this offering makes a wish, and Yee Ping, where ‘khom loi’, or floating lanterns, are released into the sky, ‘khom fai’ lanterns are hung from the houses or carried on poles as ‘khom thue’. However you look at it, this was always going to end in chaos. And so it proved. I arrived in the afternoon and was greeted by a tidy line of respectful students greeting me and praying. I reckon most of the participants were Thai, not very many tourists there. Maybe the bad press paper lanterns get elsewhere had put them off? Whatever the reason, this appeared to be very much a national festival and was in no way staged for the tourists. Trying to blend in as much as possible, I set up my tripod and started to take photographs, drinking in the amazing atmosphere as I did so. The joy was tangible, all around me thousands of Thais milled, each with their khom loi, all smiling and laughing. 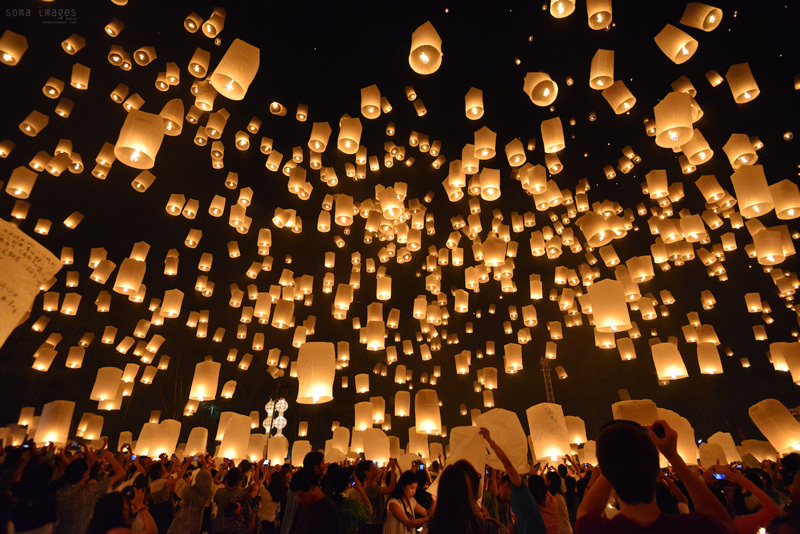 Soon the lanterns were being lit and released, floating gracefully up into the sky like a vast flotilla of jellyfish. They were about the size of a standard lampshade and had a candle or fuel cell attached. The entire ceremony was being overseen by a team of Buddhist monks, seated solemnly on a dais at one end of the area. To my mind they looked more like a bunch of extra-terrestrials in their spaceship than men of the cloth, but they orchestrated the vast numbers of celebrants efficiently. As the first of the thousands of lanterns started to rise, people were crying from the emotion of it. I quickly packed up the tripod and switched to a handheld camera, so that it was easier to move with the flow of the crowd. I hadn’t expected this much emotion, and I didn’t want to be caught out in any sudden crowd surges. It was a challenge to shoot though, with the only light coming from the flames within the lanterns. You hear people talking about an indescribable experience, which moved them beyond words. This was one of those times; you had to be there. Each lantern rose higher and higher until its flame was a mere pinprick in the sea of floating lights. You can see the milling thousands in the photographs, but you cannot truly experience the atmosphere without being there. Words fail to describe the depth of emotion here too. There was just something about standing and watching your lantern until it was indistinguishable from all the others which made it very moving.